Hartog & Bikker is an expert in warehousing, volume transports and logistics. At its Oss site, the Dutch company stores empty cans for the drinks industry. Electrically-powered forklift trucks are used to transport these items within the plant. However, recurring problems were experienced when charging the forklift truck batteries, some of which were already relatively old. As a result, the company decided to optimise its charging technology. To do so, it is relying on the Selectiva battery charging systems from the Austrian specialist Fronius, which reduce energy consumption and CO2 emissions thanks to the innovative Ri charging process. Moreover, the gentle charging process extends the service life of the batteries, and even older batteries function significantly more reliably once again. The employees remove the heavy 80-volt batteries from the vehicle using a manual lift truck, transport them carefully to the storage area and exchange them for a fully-charged battery. At the Oss site of Bikker Logistics BV, the most recent operating company of Hartog & Bikker, in the Dutch province of North Brabant, the towers of pallets are several metres high, almost reaching the hall ceiling. Around 30,000 fully-loaded pallets are stored here – often stacked in piles of three or four. Empty, brightly shining drinks cans from well-known brands of beer, soft drinks and energy drinks are securely packaged on these pallets and wait to be transported to the manufacturers who will fill them with the liquids. 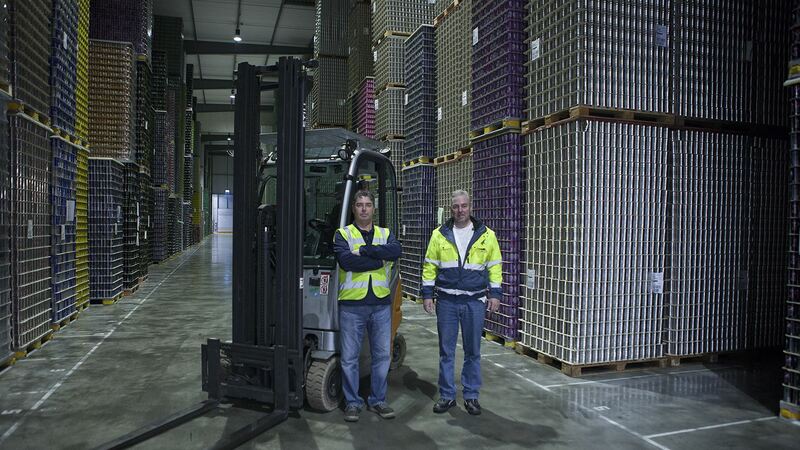 Approximately 9,000 cans fit onto a pallet – depending on the size and shape. In general, it only takes a few minutes to replace the battery. After this, the forklift truck is ready for use once again. The logistics company was established in 1931 in Leerdam by the two founders Den Hartog and Bikker. They took over the transports for the town’s glass factory – still using horses and carts at that time. In 1997, the firm was acquired by the Meeus family company which, over the years, has grown into a group of several firms and is now one of the leading logistics companies in the Netherlands. As a part of this group, Hartog & Bikker today organises and manages the complete logistics and transport flows for products such as cardboard packaging, plastic crates, plastic bottles and glass and can packaging for major international clients from a range of market segments. Hartog & Bikker has specialised in volume goods and has developed into one of the most important European transport companies for this segment. Employees based in the headquarters in Vuren and in Oss coordinate the orders for all branches, sending up to 145 HGVs out on the road every day. The majority of transports are headed for the Benelux countries, to northern France or to Germany. On average, Hartog & Bikker stores up to 300,000 pallets at its site, over an area of approximately 350,000 square metres. 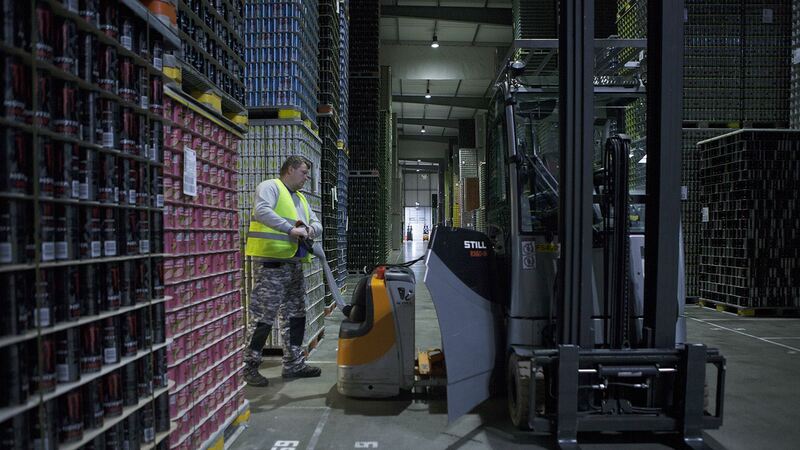 In order to move the goods around efficiently, nine electrically-powered forklift trucks manufactured by Still and R&W are used at Bikker Logistics BV in Oss. The site operates a three-shift pattern, six days a week. In order to ensure a high level of availability for the fleet, the electric forklift trucks are equipped with 80-volt back-up batteries, which are charged at a central charging station. “Some of the batteries in our lift trucks are already more than ten years old,” explains Sander Schuijers, warehouse manager at Bikker Logistics BV. Previously, these batteries were causing recurring problems. The older battery models were often not charged sufficiently, and minor defects arose frequently. “As a result, we were no longer able to fully rely on the availability of our fleet. The faulty charge cycles had a negative effect on the batteries. This was very annoying for us and cost a lot of time and money, due to the additional maintenance and repair expenses,” summarises Schuijers. Sander Schuijers, Warehouse Manager at Bikker Logistics BV, and Stevan van Laar, Account Manager at R & W Batterijen, are very satisfied with the Selectiva battery charging systems.